Around Alexander Nevsky Square and further on, between Alexander Nevsky Bridge and Bolsheokhtinsky Bridge (Peter the Great Bridge), some big changes have been happening, especially recently. 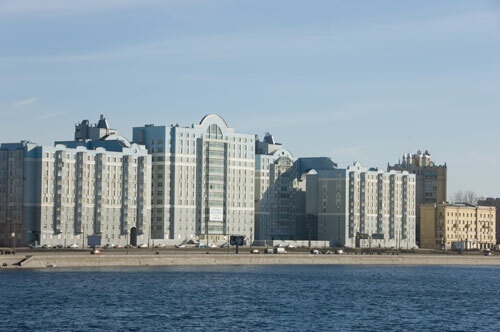 The facades of the Moskva Hotel at the Alexander Nevsky Square have been redesigned. 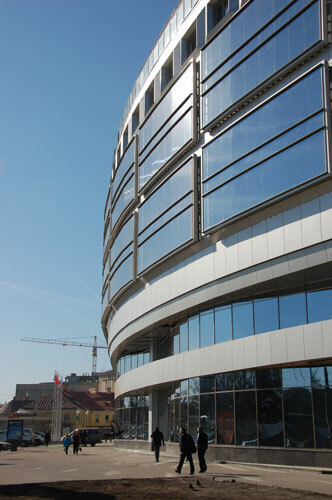 Even though in its previous form the building was not a XVIIIth century landmark, but it looked OK.
Now, however, it looks just like another business centre. 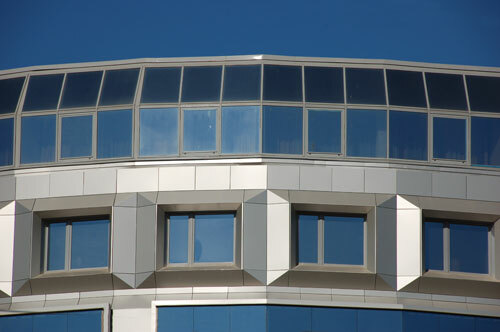 Moreover, such shiny surfaces are set against Alexandro-Nevskya Lavra on the other side of the square. Together with the monument in the foreground, where the statue somewhat loses accent when viewed on the enormous pedestal, this looks rather sad. 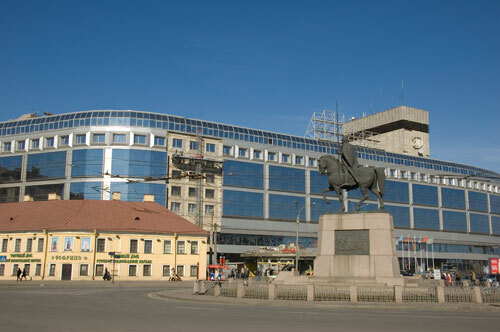 This is how the area looked a few years ago (without the monument and prior to reconstruction). 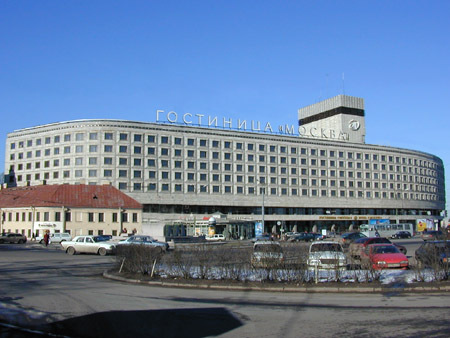 The hotel building was built by architect D.S. Goldgor in 1967-1977. 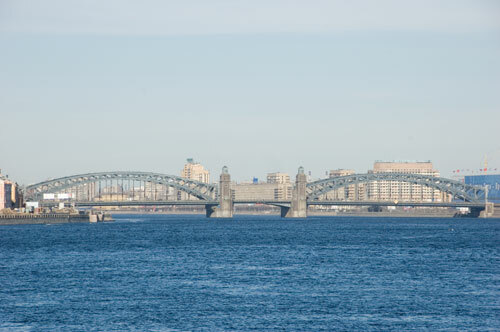 Moreover, the square used to be open towards the bridge and Neva (towards the right). Now there is something like a business centre being constructed there. During the reconstruction of the hotel some funny things happened. Next to the hotel there is was a swimming pool. A drilling machine fell from the construction site onto the swimming pool. Things happen. It just fell down. No one was hurt. And again nobody was hurt. 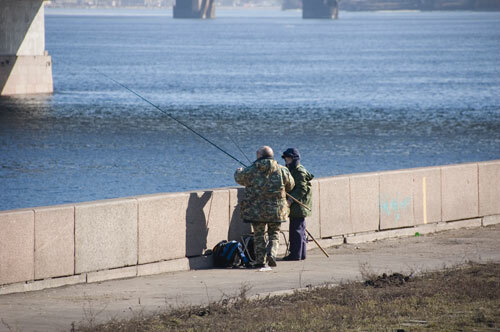 Fishermen near Alexander Nevsky Bridge. 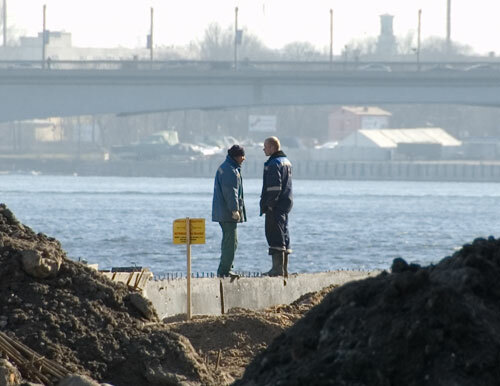 Now it is all dug up until Bolsheokhtinskiy Bridge - a road widening project. 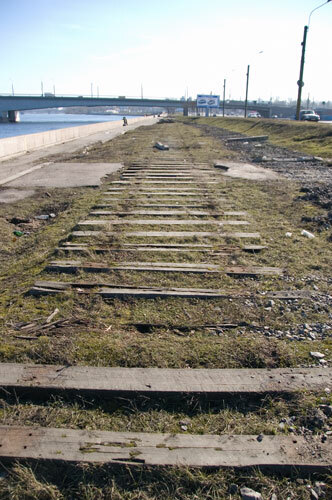 The remains of an abandoned railway line, which used to run along the embankment to the Liviz factory. 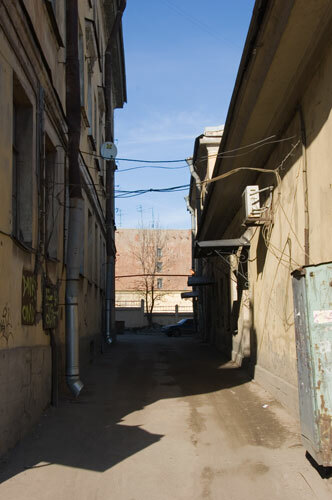 I remember from university years an old cistern standing here (cisterns were used transport alcohol to the factory). 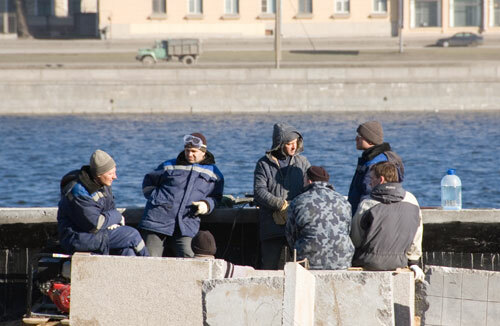 Reminiscent of "Roadside picnic" by Strugatsky brothers. 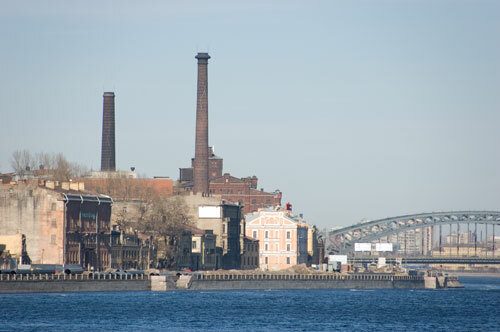 Before revolution it connected Nikolaevskaya railway to Finland (Finlyandsky railway bridge was only built in 1912). 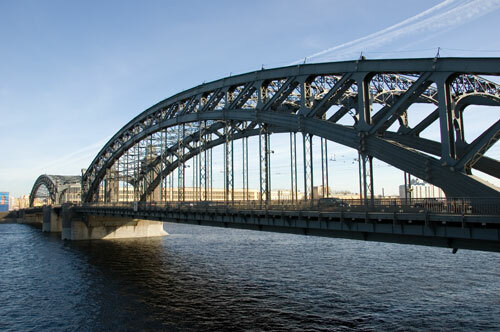 The line ran along the embankment until Liteyny Bridge, where it connected to tram tracks (in Saint Petersburg tram tracks have the same gauge as the train tracks). 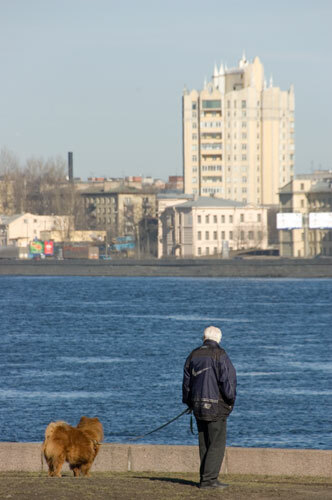 On the other side of Neva the railway separates from the tram tracks again. 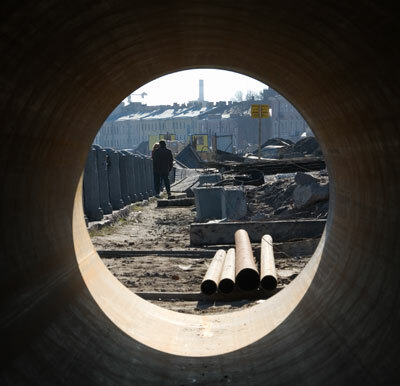 After the bridge was built, most of the railway lines were removed, except a small part. Also, during the war, echelons arrived here to load the wounded onto ambulance trams to be taken to hospitals. 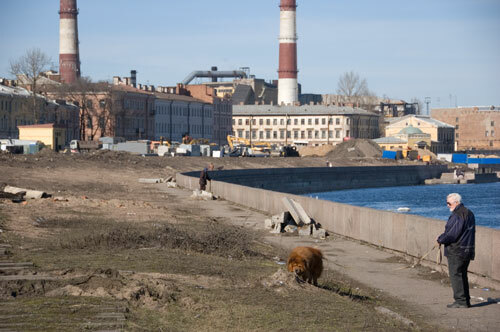 If I understand correctly, these are the pre-revolutionary factory buildings in the background (S.M. 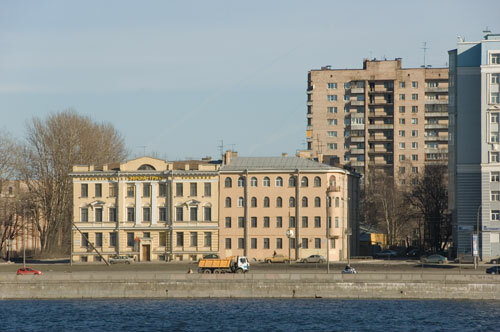 Kirov textile factory) - are also planned for reconstruction or demolition. What amazes me is the giant speed with which this is being done. Even though I am a person who takes interest in this, disappearance of houses and whole blocks takes me by surprise every time. To think that general public is being consulted on these matters would be simply ridiculous. This is, by the way, a nice place to take a walk. To tell the truth, the width of the road is of much lesser concern to me than the width of the lawn (even it being unkempt). Let's look at the other side of Neva. Everything is changing there as well. 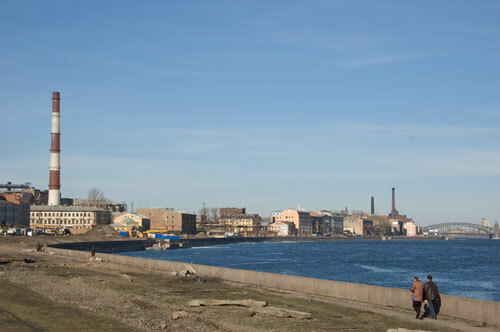 The embankment there is called Malookhtinsky prospect (I was always interested, why some roads are called "X embankment", while others are simply "X street" or "X prospect", when they all run in the same manner along the shore). 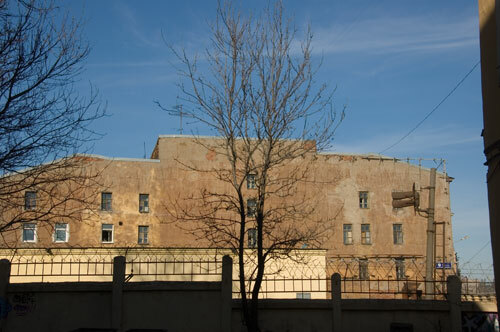 This building houses the "Higher special officers' courses of the Navy". 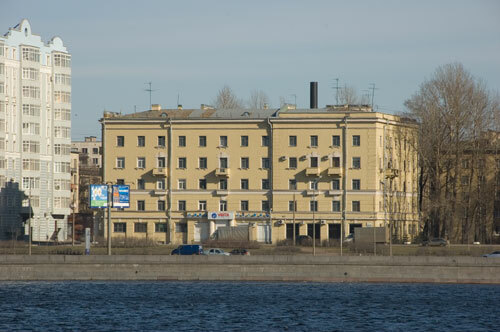 The building is from the Stalin epoch. 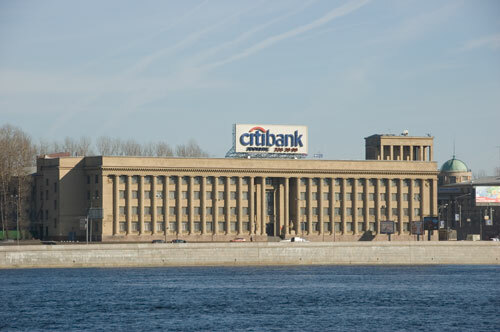 The Citibank billboard, by today's standards, is a pretty minor thing. Here, in the foreground, there is something new, some kind of shop. 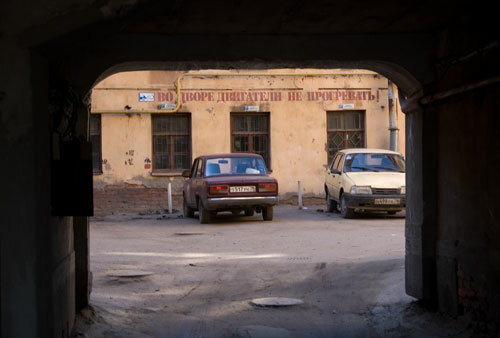 Behind - late Soviet building "AO Gipropribor" (this organisation designs industrial buildings since 1930 - back then it was called "Gipromash") and, next to it, on the other side, "NPP Burevestnik" (exists since 1959, manufactures X-ray and other equipment. 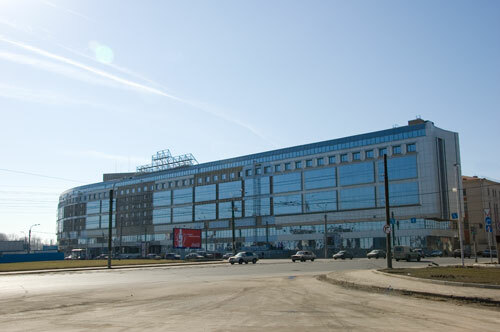 Now also known as Burevestnik Business Centre). Construction of an odd-looking residential building. 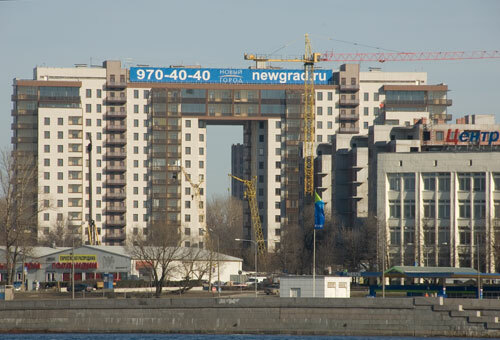 It's called "Residential complex 'Novy Gorod' (New City)". It is turned with its side towards the embankment, so the main park is not visible from here (construction is still continuing). 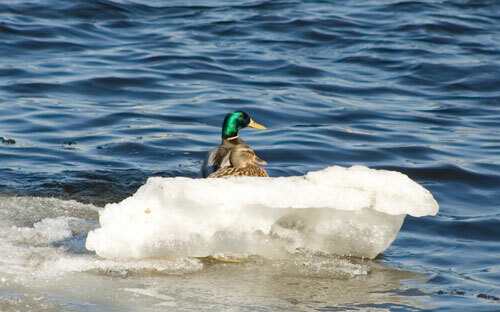 A duck couple enjoys this year's last opportunity to sail an ice-floe. 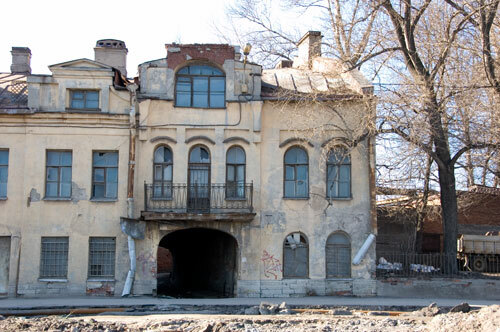 Let's look into the courtyards along Sinopskaya embankment. In case someone is not aware of the rationale behind the sign "Do not warm up engines in courtyard" - this is a closed courtyard, and the air in the surrounding apartments can quickly become unbreathable. It's funny - as I was writing the comments, I noticed the plaques above the windows. They specify have a "P" symbol along with car's number (although it actually corresponds to the number plate only in the case of the left hand side car). By the way, the plaques are not home-made, but tidy and uniform. Don't remember the street number of this house. If somebody know what this is, please let me know. The people are getting more prosperous. 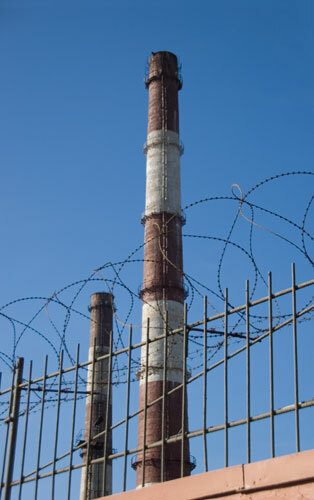 Recently I have started noticing pipes with their bottom part surrounded with a metal mesh - to protect them from kicks. 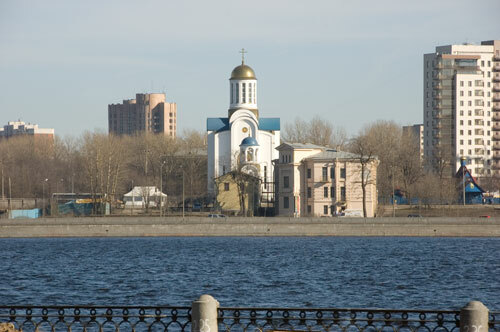 Church of Dormition of the Theotokos. 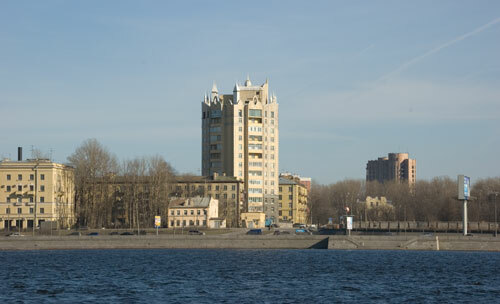 A new building between numbers 10 and 36 called "Big house on the Neva". 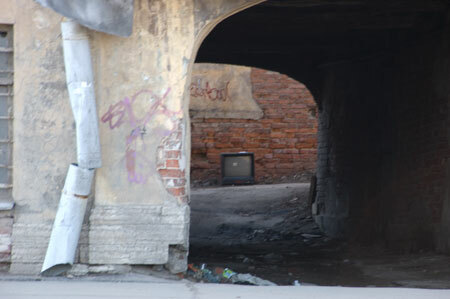 A brick-monolithic construction. Developer - "ZAO Phenix"
At some point of time buildings like this used to be called "Luzhkov's houses" (for Luzhkov, the mayor of Moscow, where such houses were built quite intensively). However, recently I haven't heard people addressing them by this name. 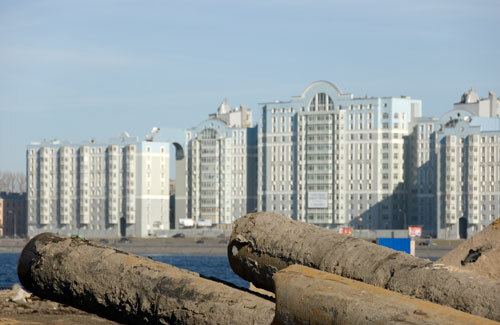 Malookhtinsky prospect 6 and 8 directly adjacent to each other. 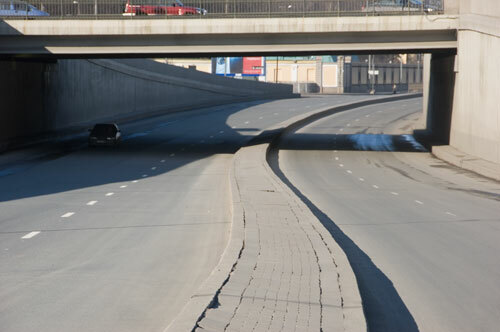 Road before entering the bridge. 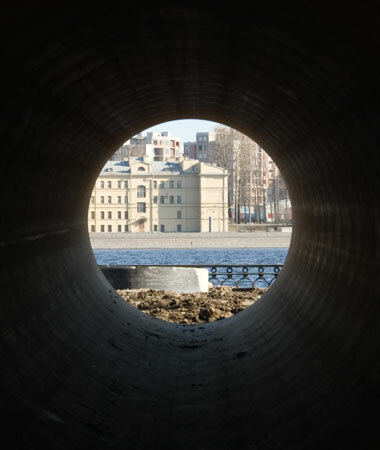 In the next album we will finish looking at the other shore, cross the bridge and have a look at the future Gazprom City site.